When Elizabeth Greenfield Krohn got out of her car with her two young sons in the parking lot of her synagogue on a late afternoon in September 1988, she couldn't have anticipated she would within seconds be struck by lightning and have a near-death experience. She felt herself transported to a garden and engaging in a revelatory conversation with a spiritual being. When she recovered, her most fundamental understandings of what the world is and how it works had been completely transformed. She was “changed in a flash,” suddenly able to interact with those who had died and have prescient dreams predicting news events. She came to believe that some early traumatic and abusive experiences had played a part in preparing her for this experience. Told in matter-of-fact language, the first half of this book is the story of Krohn’s journey, and the second is an interpretation and analysis by respected professor of religion Jeffrey J. Kripal. He places Krohn's experience in the context of religious traditions and proposes the groundbreaking idea that we are shaping our own experiences in the future by how we engage with near-death experiences in the present. 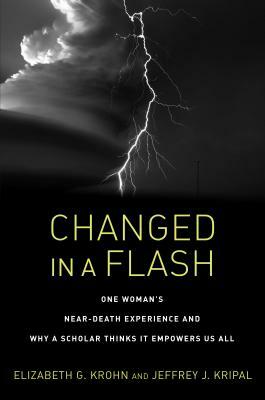 Changed in a Flash is not about proving a story, but about carving out space for serious discussion of this phenomenon. ELIZABETH GREENFIELD KROHN was a wife and mother of two young boys when she was struck by lightning in the parking lot of her Houston synagogue, and her most fundamental understandings of what the world is and how it works were completely transformed. She is now a grandmother living in Houston. JEFFREY J. KRIPAL is a well-known professor of religion at Rice University and the codirector of Esalen's Center for Theory and Research. He is the author of many books on religion and unexplained phenomena, including, with Whitley Streiber, The Super Natural. He is a key figure in consciousness studies within academia and beyond.